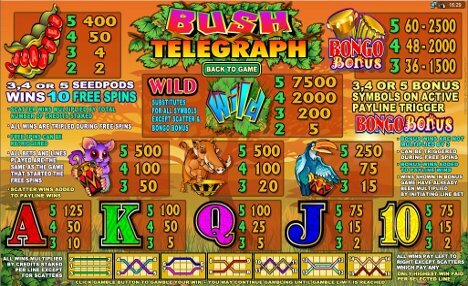 The Bush Telegraph slot machine is a Microgaming powered online slot machine that features 5-reels and 15-paylines. The maximum wager on the Bush Telegraph slot machine is 75-coins, which can be worth anywhere from $0.75 per spin all the way up to $75.00 per spin depending on the denomination that you choose. Our favorite thing about the Bush Telegraph slot machine is that it is loaded with features; including wild symbols, a free spins bonus game, a gamble feature, and an entertaining bonus game called the Bongo Bonus Game. In addition to these great features, the fact that Bush Telegraph has multiple paylines makes it all the more enjoyable because it helps increase your chances of winning! When you’re playing the Bush Telegraph slot machine, you’ll want to keep an eye out for the Wild Bush symbol. This symbol acts as a wild symbol, which substitutes for other symbols to complete winning combinations. The only two symbols that the Wild Bush doesn’t substitute for are the Seedpod symbol and the Bongo Bonus symbol. Now that you know a little bit about the Bush Telegraph slot machine, you’ll be happy to know that you can try out this game for free without leaving this page! Simply scroll down to instantly play the Bush Telegraph slot machine in your favorite web browser! Luxury Casino is one of the top online casinos that offers the Bush Telegraph slot game! They are powered by the extremely popular Microgaming software and they have hundreds of great games to choose from; including slots, video poker, blackjack, and more! At the moment, all new players are eligible to receive up to $1000 in free bonus money after making an initial deposit,so head over to Luxury Casino today to take advantage of this great offer! We recommend Guts Casino to all the Bush Telegraph slot game lovers! Right now, all players at this exciting new online casino can get an amazing 300 pounds deposit bonus to try out all of their online casino games! As an added bonus, players are also entitled to receive 100 free spins on the Starburst game in additional free casino money bonuses! One of the best places to play the Bush Telegraph slot machine is at Platinum Play Casino. That’s because this Microgaming powered online casino is currently giving away $1,500 in free bets to all of their new players just for signing up! The great thing about this bonus is that there is no deposit required, which means you can actually try out their real money casino games for free without risking any of your own money! So if this sounds like something you’re interested in, head over to Platinum Play Casino today to get your $1,500 bonus before this offer ends! Play the Bush Telegraph slot at Platinum Play Casino! Jackpot City Casino is another great Microgaming powered online casino that is giving away free bonus money to all of their new players! Simply register for free and you’ll instantly be eligible to receive $25 in free casino money with no deposit needed! You can use this free bonus money to try out all of their great games; including the wildly popular Bush Telegraph slot machine! There’s no telling how long this offer will last though, so head over to Jackpot City Casino to get your free $25 bonus today before it’s too late! Play the Bush Telegraph slot at Jackpot City Casino! One Microgaming powered online casino that we never hesitate to recommend to any of our website visitors is All Slots Casino. They have been around for years and they have a huge selection of casino games to choose from; including the Bush Telegraph slot machine! The great thing about this particular online casino is that they are currently giving away up to $500 in free bonus money to all of their new players, so head over to All Slots Casino today to learn more about this great offer! Play the Bush Telegraph slot at All Slots Casino! Royal Vegas Casino is a Microgaming powered online casino that offers hundreds of different Las Vegas style casino games that you can play from the comfort of your own home. The great thing about this established and respected online casino is that their minimum deposit is just 5-credits! That means you don’t have to spend a lot of money to enjoy playing all of the real money casino games that are available at Royal Vegas Casino! Play the Bush Telegraph slot at Royal Vegas Casino! If you haven’t played at Gaming Club Casino before, now is the perfect time to do so because they are currently giving away 30 free spins to all of their new players! The best part about this promotion is that they is no purchase necessary, which means you can try out their real money games for free without risking any of your own money! In addition to this free bonus, they are also giving new players $100 extra after making an initial deposit, so head over to Gaming Club Casino today to get in on the action! Play the Bush Telegraph slot at Gaming Club Casino! If you’re feeling lucky and you think you’re going to be the next online casino jackpot winner, then there’s no better place to play than at All Jackpots Casino! They are powered by Microgaming software and as their name suggests, they have some of the biggest casino jackpots available online! Right now, they are giving away up to $200 in free bonus money to all of their new players, so there has never been a better time to signup and start playing at All Jackpots Casino! Play the Bush Telegraph slot at All Jackpots Casino! Believe it or not, you can play real money casino games online for as little as 1-credit! That’s right; at some Microgaming powered online casinos such as 7 Sultans Casino, you can deposit as little as 1-credit and get instant access to all of their real money casino games! This is one of our favorite online casinos because they have been around for years and they are well respected throughout the gaming industry, so we’re confident that you’ll be impressed with everything that 7 Sultans Casino has to offer! Play the Bush Telegraph slot at 7 Sultans Casino! First Web Casino is a great place to play the Bush Telegraph slot machine because they have been around for years and are considered by many to be one of the most trustworthy online casinos. They are powered by Microgaming software and they have hundreds of great games to choose from; including slots, video poker, blackjack, and more! Right now, First Web Casino is giving away $75 in free bonus money to all of their new players, so head over to their website today to learn more about this great promotion! Play the Bush Telegraph slot at First Web Casino! One of the oldest and most trusted online casinos is Lucky Nugget Casino. They have been around for more than a decade and players from around the world have had nothing but great things to say about them, which is why we are proud to recommend them to all of our website visitors! At the moment, they are giving away up to $1,000 in free bonus money to all of their new players, so head over to Lucky Nugget Casino today to take advantage of this great offer! Play the Bush Telegraph slot at Lucky Nugget Casino! If you’re looking for some Las Vegas action that you can experience from the comfort of your own home, we highly recommend checking out Vegas Palms Casino today! They are powered by Microgaming software and they have hundreds of real money casino games that you can play at home in your favorite computer chair! In addition to all of their great games, they also have a great new player welcome promotion that you’re sure to love. At the moment, when you signup and make an initial deposit of just $50, you’ll get $100 in free bonus money added to your account at Vegas Palms Casino! Play the Bush Telegraph slot at Vegas Palms Casino! We’re big fans of Red Flush Casino because they have been around for more than a decade and they have a great selection of games to choose from; including the always entertaining Bush Telegraph slot machine! At the moment, they are giving away $200 in free bonus money to all of their new players, so there has never been a better time to signup and start playing! To learn more about this great promotion, simply visit the Red Flush Casino website and you’ll be able to find everything you need to know to get started! Play the Bush Telegraph slot at Red Flush Casino! Wild Jack Casino is a member of the Jackpot Factory group of online casinos, which is known for offering players great games, great bonuses, and extremely fast player payouts! So if you’ve been searching for an online casino that you can trust, you definitely can’t go wrong with this Microgaming powered online casino. And at the moment, they are currently giving away $3,000 in free bonus money to all of their new players, so there has never been a better time to get in on the action at Wild Jack Casino! Play the Bush Telegraph slot at Wild Jack Casino!